I am giving away 2 of these tables for FREE. CLICK HERE and enter to win! Hi, Shaun here from GENERALYOURHOME.COM – where I use my experience of managing multi-million dollar construction projects to teach you how to manage the construction of your own home and save thousands of dollars. I am really excited to share the Chalktivity Table with you today. It’s perfect timing with Christmas right around the corner, and this is an inexpensive, easy-to-build gift for the kiddos. 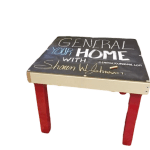 When my wife and I didn’t have a lot of money or space, but still wanted to provide great experiences for our children, we created the Chalktivity Table, which is three activity tables in one. My kids have absolutely LOVED this table! We use the regular table for snack time or coloring books. It is also great when we have friends over for dinner and we need extra seating for children. While we are using the regular table, we store the top part under a bed or lean it against a wall until we need it for another activity. The chalkboard slips over the top of the regular table. Our kids practice writing letters, draw pictures, and play tic-tac-toe. The chalk board is really high quality and cleans up nicely. We flip the top part over for sensory activities like digging in a bowl of rice or writing on a tray of salt. The sides that once held the chalk board in place become perfect little walls to keep a mess from falling off the table. Tiny blocks stay up high instead of on the floor where our baby might find them and choke. Clean up time is a breeze because the top part can be lifted and tilted so everything falls right back into the container or garbage can. A grip mat will help the sensory top stay more securely in place. Please be respectful and only build these for personal use. When I build these, I just use my chop saw at home. However, I know that not everybody has a chop saw and I wanted to make this as easy as possible, so I am going to show you how I made the cuts at Home Depot with their hand saw. You could also ask a representative to cut your boards for you with their electric saw. To get started you will want to mark the 8′ MDF board at 22 1/2″ and line up the saw using the yellow mitre box at the table and make your first cut. Once you have one 22 1/2″ board, use that board to measure for your next cut. Do not mark out the board all at once. Mark it, then cut it, mark it, then cut it until complete. Find any worker at home depot, usually wearing an orange apron, and tell them you need your board cut. He or she will take you to the electric saw where someone will be waiting to help you. Tell the Home Depot representative that you want the chalk board cut into a 23 1/4 inch square. There is enough chalk board to make two tables, or you can make something else creative with the left over chalk board material. I could have asked a home depot representative to cut the MDF board for me too, but sometimes they are not very precise. After watching them cut my chalk board, I wish I would have had them cut my MDF board too, because they did a pretty good job this time. When cutting the MDF, start off cutting slowly so you get a nice straight edge. Stabilize the 22 1/2″ side of the board with the hand you are not using to cut. Ask the Home Depot representative to cut your chalk board to the precision of 1/16th of an inch. Before you start drilling, I like to take a little sand paper and make sure the edges look smooth because they will be exposed. Each board will be getting two holes drilled in it at one end only. You need to mark where these holes will go on one end of each board. It doesn’t matter which end, just make sure that each board is only marked on one end. You can print the layout paper and line the edges up to mark one side of each board. I like to use a pair of scissors to mark my holes by poking them through the paper into the wood. Now that the boards are marked, place the board you intend to drill on top of a scrap piece of wood that you can drill through. Take out the 1/2″ paddle bit or drill bit and slightly make an impression in the MDF. DO NOT DRILL ALL THE WAY THROUGH THE WOOD. This impression is only used to house the head of the screw. Look at the size of the head of the screw to help you judge how deep to make this impression. It really should need to be more than 1/8 of an inch. Its time to drill a hole all the way through the boards. Take out the 9/64″ drill bit and put it in the center of the impression you just made and drill all the way through the board. Now its time to lay out the frame of this table top and drill through the length of the boards. Look carefully at the image above to see how this frame is to lay out. You should only be drilling holes in one side of each board. Line up the boards as shown above with the edges flush with each other. Once you have your edges lined up, use your drill to make a slight impression on the board perpendicular to the board you have already drilled holes into. Doing this allows you to focusing only drilling through one board straight. Now that you have marks on the board, drill a straight hole through the length of the board on your two marks. When drilling these holes, make sure you insert the drill bit as far as it can go. IMPORANT NOTE: It is extremely important that you drill these holes straight. If you do not, they can split when you go to put a screw in them. When drilling the holes, it makes it easier if you pull the drill bit in and out, letting the wood particles come out instead of forcing the bit in. Go slow, there is no need to rush this process. Make sure you understand how the boards are to lay out before you start drilling any holes. If you want to verify your layout is correct, get the chalk top that home depot cut for your and see if it fits squarely over your frame. When drilling the impression holes I recommend using paddle bit vs a drill bit. You have much more control with a paddle bit. When drilling the impression holes, go slowly so you can gauge how far down you are going. When tightening the finish screws, go slow and make sure they are flush with the face of board. Sometimes if you go to fast, you can strip them and make them useless. Place a bead of glue on the back edge of the board as shown below. line the boards up as you did when you drilled through the length of the board. When the boards are lined up, place the first screw in half way only. This allows you to get the bottom screw in before the top screw is to tight that you can’t move it. line up the bottom screw and screw it in all the way to where the screw face is flush with the board face. Once the bottom screw is tight, screw the top screw in tightly. Now that the frame is built, it’s time to put the chalkboard on top. To do this, place a small bead of glue around the entire frame and gently place the chalk board top on the frame . Once the frame is sitting square, it is time screw down the chalk board top. You will be placing 8 screws down trough the frame with 4 screws in each corner, and 4 screws in the center of each board. To mark the center of each board, pull your tape measure across and make a mark at 11 1/2″. Make sure your mark is such that it will go through the center of the MDF frame board, 5/16″ in from the edge. in each corner, and on each mark, take the 1/2″ drill bit or paddle bit and make a small impression to house the head of the screw. Once each impression is made, take the small 3/4″ screws and place them through the top and into the frame, without drilling a hole this time. Make sure the screw is flush with the top of table. This step is so simple, I am going to let you just look at the pictures. Great Job, you have completed your Chalktivity Table! Now your top is ready to slide right over the table and your kids can start playing. If you would like to learn more about what I do over at www.generalyourhome.com, go ahead and click here to listen to my podcast that explains what it means to build your own house. Or click here to check out my latest blogposts. 1) could you use chalkboard paint instead of an actual chalkboard, and swap out some other kind of wood? 2) could you use a whiteboard instead of a chalkboard? Fun project. Thanks for posting! This is such a great idea! One of those “why didn’t I think of that” projects. My boys would LOVE this, and it is a great idea for someone who doesn’t have a lot of space. Thanks Amy! I have to give all the credit to my wife, she is pretty creative. I hope you enjoy making it, or win one of the free ones! Here is a picture of my little boy playing with one 6 years ago when we first made them. We don’t normally play in the street, but we sold them for christmas that year 🙂 Thanks for reading! This will go perfectly in our toy room!! Thank you for showing how to make it. I’m still learning the basics of building and this is doable! No problem Jennifer! This is a pretty good one to start out with if you are just learning how to build things. Here is a little tip. MDF is a great material, however, it gets damaged easy and that makes it a little more difficult to work with. If you want to spend spend $6-$8 dollars more, you can buy some pine at Home Depot that is same size and it will be easier for you to work with. Just follow the same instructions. I have several of these Ikea tables and love how you made the extra top – such a clever idea!! i am going to have to try this out. Oh my gosh, those are so cute! My kids would LOVE those.